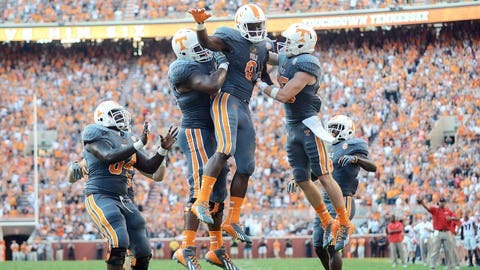 Could Marquez North finally make his mark on Team 119 Saturday? The Vols could be getting some much needed reinforcements Saturday, as head coach Butch Jones announced the likely return of a few key players thought lost for an extended amount of time. "Kyle Phillips will practice today after going through some rehabilitation with his shoulder. It’s very stable. It’s very strong, so that’s been a positive," Jones said. "Kyle is going to practice today and we’ll see how it goes. Same thing with Marquez North. He did practice, limited, but continued to improve. "Dylan Wiesman practiced yesterday so that was a positive, and Dylan’s a tough young man so we fully anticipate him being ready to go. Brett Kendrick was limited. That will be ongoing. He’s limited right now so we will see how he progresses, but to his credit he keeps grinding it out and could get better by Saturday." Considering the Vols will be going up against some of the best linemen they will see on both sides of the ball, having Phillips, Wiesman and Kendrick available could be huge this weekend. With the news of Pig Howard’s dismissal, North will be looked upon to lead a struggling receiving corp. If North can make some plays in the passing game, Georgia may be forced to open up its defense to Tennessee’s outstanding running game.